This week's favorite reader review of The Lacemaker's Secret comes from Marla-Bradeen and appears on barnesandnoble.com. "Memorable characters, an intriguing mystery, and a fascinating look into the life of early settlers make this an enjoyable read..."
NOTE: Lacemaker's is also available for the Kindle and other e-readers. Wishing you all peace and light today and throughout the holiday season. This week's favorite review of The Lacemaker's Secret is posted on Tam's Mystereity Book Reviews blog. Many independent bookstores ship books, including trade paperback copies of Kathleen's Chloe Ellefson mysteries. Her local indie, Mystery To Me, goes one step further—they ship copies of The Lacemaker's Secret signed by Kathleen! "I’m entirely captivated by this series and look forward to re-reading those I have while waiting for this new book!" 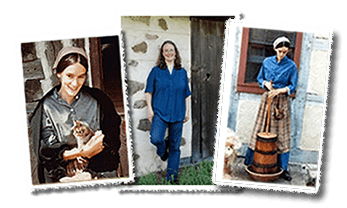 Kathleen will join fellow authors Jerry Apps and Marnie Mamminga in Madison, WI at 4:30 PM, Sunday, December 9th, for a special panel discussion on writing about the life and landscapes of Wisconsin and the Midwest. They'll share their thoughts on the writing process, the publishing world, and their works. Attendees are welcome to ask questions and participate in the discussion. Books will be for sale and signing. This is event is co-sponsored by the Wisconsin Historical Society Press and the 702WI Writer Incubator. Space is limited. Tickets can be purchased online by clicking HERE. The popular Mystery To Me bookstore in Madison, WI has announced their store's bestselling 2018 mysteries list. Check out number one! This week's favorite reader review of The Lacemaker's Secret is by J D and appears on the book's page on Amazon.com. "An intriguing mystery combined with amazing history provides a delightful read. Chloe stories are the best." Chloe 10 - Sneak Peek! Posted December 2, 2018 on the Sites And Stories blog. Serendipity! Rita recently read Heritage of Darkness and decided to make her first visit to Vesterheim Norwegian-American Museum to enjoy its' Norwegian Christmas event. She had no idea Kathleen would be there signing her Chloe Ellefson mysteries! Turnout for the signing was good—despite the windy snow-sleet-rainy weather. Yesterday's special Chloe Ellefson / Heritage of Darkness tour at Vesterheim Norwegian-American Museum in Decorah IA was great fun! Those who attended were treated to an unexpected surprise. Kathleen publicly revealed—for the very first time—details about the next Chloe mystery! Many thanks to the museum for hosting a wonderful tour, and to all who took Friday off to attend. The comment below was posted by "anontmous" on The Lacemaker's Secret book page on Amazon.com. "My friend & I love Chloe Ellefson mysteries, I buy mine for my kindle, and then a paperback for her for Christmas. Then we plan a trip to the historic site from the book. We have learned so much and have had such great fun." "The Lacemaker's Secret is a gem..."
The comment below was written by Holly Feldman in response to a post about The Lacemaker's Secret on Kathleen's Facebook Author page. "I'm only about half way through the book but I feel a late, page-turning, groggy-the-next-day, but-so-worth-it night coming on..."
Posted November 25, 10, 2018. This coming Saturday, December 1st, Kathleen will be at Vesterheim Norwegian-American Museum in Decorah IA from 1-4 PM in their fabulous gift shop, as part of their always delightful Norwegian Christmas event. Kathleen will be meeting readers and signing her award-winning Chloe Ellefson mysteries—including Heritage of Darkness (set at the museum) and the just released The Lacemaker's Secret. This week's favorite reader review of The Lacemaker's Secret is by ABCme and appears on the book's Goodreads page. Kathleen and Mr. Ernst wish you and yours a peaceful and bountiful Thanksgiving. We're grateful for all of you! Kathleen posted this statement today on her Facebook Author page. "When publisher Midnight Ink announced that they were shutting down, I wasn't sure where that left the 10th Chloe Ellefson mystery. I am happy to report that Midnight Ink *is* going to publish the book next year. I'll share more information after the holidays. Thanks to all you wonderful readers who have supported the series!" Posted November 13, 2018 on the Sites And Stories blog. This week's favorite reader review was posted on The Lacemaker's Secret page on Amazon.com by Petsitter about the Chloe Ellefson mysteries. "I love all the books in this series. They have a perfect blend of history, romance and mystery. Well written with very real, flawed characters that I root for. I always look forward to a new Chloe mystery and have never been disappointed!" What Americans now observe as Veterans Day was originally established as Armistice Day. It marked the date a cease fire was signed ending the fighting in World War 1—exactly one hundred years ago today. Forty million soldiers and civilians were killed or wounded in what became known as "the war to end all wars." Mr. Ernst's grandfather, James Frank Cantwell, served as a US Army 2nd Lieutenant in France, where he heard the guns fall silent "on the eleventh hour of the eleventh day of the eleventh month." Kathleen's back home from her writing retreat, where she worked on what will be the tenth book in her Chloe Ellefson mystery series. The manuscript is ten thousand words closer now to completion—and on track for publication in 2019. This week's favorite reader review of The Lacemaker's Secret was posted on the book's Amazon page by Cindy-Natalie's Aunt. "Twists, turns, suspense in a well documented historically accurate novel. I am very familiar with Namur-Rosiere Belgian region area where the novel is set, as it is where my late husbands ancestors settled in the 1850’s, and have lived ever since. Well written! Highly recommended!" Kathleen leaves today for an undisclosed location where she will be spend five days working on the manuscript of her as yet unnamed tenth Chloe Ellefson mystery—slated for release in 2019. Kathleen will be offline and 'heads down' until this coming weekend. Urgent inquiries can be directed to Mr. Ernst, who is at home keeping the office open. Green Lake Mystery Readers are Great! Kathleen presented her Chloe Ellefson mysteries program this afternoon at the Caestecker Public Library in Green Lake, WI. Cold, rainy, windy fall weather may have dampened attendance, but not the enthusiasm of the mystery fans who were there. Mr. Ernst was kept so busy with Chloe book sales, and Kathleen with signing them and answering questions, that they completely forgot to take photos. D'oh! Kathleen had a delightful time last night at the wonderful DeForest Public Library. She spoke with a group of dedicated Chloe Ellefson fans who came to get copies of the most recent books, including the just-released The Lacemaker's Secret. Kathleen talked and answered questions about researching and writing the new mystery. This week's favorite reader review about The Lacemaker's Secret was posted on the book's Amazon page by LaGringa. On Saturday readers gathered from all over Wisconsin and from out-of-state to interact with authors and honor young writers at Edgerton's Sterling North Books & Film Festival. Kathleen spoke with an audience about researching and writing her American Girl books, signed copies of her now thirty-seven children's and adult books, and awarded prizes to five very deserving young writers. It was a wonderful day. 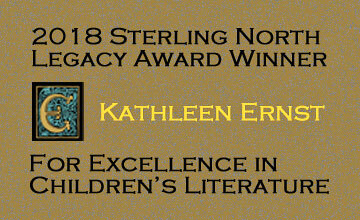 This weekend Kathleen was very honored to receive the 2018 Sterling North Legacy Award for Children's Literature at the 13th Edgerton Sterling North Books & Film Festival. The award was given in recognition of her twenty-five published children's books, and came with a handsome framed certificate and check for one thousand dollars. This week's favorite reader review about Kathleen's The Lacemaker's Secret was posted on the Open Book Society website by Jeanie. Posted October 21, 2018 on the Sites And Stories blog. Despite the un-forecasted winter weather, Kathleen and many stalwart Chloe mystery readers enjoyed a great visit and book signing at The Cornish Corner in Mineral Point WI yesterday afternoon. Many thanks to Kendra Goodnow (pictured) for demonstrating the now rare art of making bobbin lace—featured in Kathleen's The Lacemaker's Secret. Midnight Ink Books, publisher of the Chloe Ellefson mysteries, has just announced it is closing down in 2019. Few other details are known yet. Kathleen is under contract with Midnight Ink to deliver the next book in the Chloe Ellefson series. Upon hearing the news Kathleen issued the following statement: "I am 40,000 words into the 10th Chloe mystery, and I intend to finish it and get it out into the world." Kathleen will be meeting the public and signing copies of her most recent Chloe Ellefson mysteries—the just released The Lacemaker's Secret as well as the Mineral Point-based Mining For Justice—at The Cornish Corner in charming Mineral Point, Wisconsin, from 1 to 3 PM on October 20th, during the popular Fall Art Tour. This free, public event will also include a bobbin lace making demonstration (a now rare art form that is featured in Lacemaker's). And while you're in town, consider touring the Pendarvis Historic Site, where key scenes in Mining For Justice are set! Saturday was a beautiful fall day at Old World Wisconsin and site visitors and staff snapped up every single copy of The Lacemaker's Secret in the museum store. (Kathleen brought extras so no one went away disappointed.) This was her ninth year 'signing books where Chloe works' and Kathleen is already busy writing the tenth mystery. It's readers like those who showed up Saturday who make all this possible. Thank you! Seventy-eight Chloe Ellefson mystery readers filled Madison's Mystery To Me bookstore last night to hear Kathleen introduce The Lacemaker's Secret and answer their questions about Chloe, Roelke, researching and writing the book, and what comes next in the series. Then it was on to door prizes, sampling Belgian pie from Door County, and getting their newly acquired books signed and personalized by Kathleen. The evening proved once again that Chloe (and Roelke) fans are the very best! Thank you, thank you, thank you all! Reader demand for The Lacemaker's Secret has catapulted it—and six other Chloe Ellefson mysteries—into the Top 1% of all US print book sales. (Source: NPD BookScan.) Thank you Chloe fans! Today Kathleen appeared on Wisconsin Public Radio's The Larry Meiller Show to discuss The Lacemaker's Secret, the just-released ninth novel in her long-running Chloe Ellefson Historic Sites mystery series. You can listen to an archived recording of the interview—streaming or as a podcast—on the WPR website or the Lacemaker's book page on Kathleen's website. Kathleen will be greeting Chloe fans, talking about the new book, and autographing copies from 6:30 PM to 7:30 PM on Thursday, October 11th. There will be door prizes and a book-themed dessert too. This will be the very first public opportunity in southern Wisconsin to get an author signed copy of The Lacemaker's Secret. NOTE: Mystery To Me is asking people to pre-register for this free event by clicking HERE. The Lacemaker's Secret - Official Release Day! After a year of researching, writing, and editing, Kathleen's newest Chloe Ellefson mystery is now officially available in trade paperback and ebook formats! Ordering links to indie bookstores, Amazon, Barnes & Noble, Books-A-Million, and others can be found HERE. Heartland is a regional trade show attended by some 350 independent bookstores in the Greater Midwest US (it is not open to the public). Kathleen will be signing copies of her new Chloe Ellefson mystery, The Lacemaker's Secret, from 11:30 AM to 12:30 PM, this Friday, October 5th, at the Midnight Ink table in the Llewellyn Worldwide booth (328). 45 Days in Top 1% - Pre-Release! Today was the very first public book signing of Kathleen's new ninth Chloe Ellefson mystery, The Lacemaker's Secret, and Chloe fans kept her busy personalizing copies for the first hour and a half straight. The multi-author event included fellow Midnight Ink writer Darci Hannah (pictured with Kathleen). The Peninsula Bookman sponsored the signing, held outdoors on a crisp Wisconsin fall day in lovely Door County—where much of Lacemaker's is set. Kathleen's Facebook Author page readers has now received forty one hundred Likes, a milestone that reflects in part the interest in the Chloe Ellefson Mystery Giveaways and the pending release of The Lacemaker's Secret. Kathleen's Fall 2018 newsletter just went out today, and it's chock full of information about The Lacemaker's Secret and its initial book launch events—plus news for readers of Kathleen's children's books. Read all about it by clicking HERE. Posted September 18, 2018 on the Wisconsin Public Television blog. Meet Kathleen and Mr. Ernst at the Peninsula Bookman in the Door County resort town of Fish Creek, WI between 10 AM and 5 PM, Saturday, Sept. 29th, for this free event. Posted on September 15, 2018. The Lacemaker's Secret - Giveaway Winners! The five lucky winners of advance review copies of Kathleen's next Chloe Ellefson Mystery, The lacemaker's Secret, are: KAREN AGEE, PHYLLIS NOONAN, CLARISSA PETERSON, LESLIE ROBINSON, and AMY OLSON SULLIVAN. Each will receive an author signed and personalized, trade paperback ARC, which will be rushed to them via Priority post so they can begin reading it three weeks before its official October 8th release. Kathleen's home now from her most recent writing retreat, having added 20,000 words to next year's Chloe 10 manuscript. On her way back she spent a wonderful day exploring the old log buildings at the Hanka Homestead Finnish Museum near Baraga in the Upper Peninsula of Michigan. Her guides were Bill Tishler (left) who wrote the master plan for Old World Wisconsin; and Alan Pape (right) who managed the selection of historic buildings for Old World, and their disassembly, transportation, and reassembly on site. Their work is responsible for how OWW—and Hanka—look today! Kathleen just drove off on another solo week-long writing retreat (guess where) to work on the tenth Chloe Ellefson mystery, for 2019. Once she gets home, her focus will turn to fall events, including the official release of Chloe 9, The Lacemaker's Secret, on October 8th! Kathleen's back from last week's writing retreat and feeling very grateful. Huge thanks to the Council for Wisconsin Writers and the wonderful folks at the Edgewood College operated Ernest Hupeden's Painted Forest in Valton, WI, for making it possible. Yesterday the lovely rural area of Wisconsin where Kathleen is on a writing retreat this week was hit with heavy rains that caused terrible flooding and damage. Kathleen safely escaped the worst of it, losing just a day of writing. Many in our state were not so lucky. This week Kathleen is away on a solo writing retreat, working on next year's Chloe Ellefson mystery (#10). She sent this photo revealing the writing space she has settled into. Fly fingers, fly, Kathleen! Mining for Justice - Giveaway Winners! The winners of this month's Chloe Ellefson Mysteries Giveaway are SHIRLEY HYING, DIANE JOHANSON and SUE SMITH. Each gets an author signed, personalized, trade paperback of Mining for Justice, the eighth book in this award-winning series. NOTE: in September Kathleen will give away Advance Reader Copies (ARCs) of Chloe 9, The lacemaker's Secret, three weeks before the book becomes available in October! This month Kathleen is giving away trade paperback copies of the eighth book in her Chloe Ellefson mystery series: Mining for Justice. To enter, leave a comment on the giveaway post on her Facebook Author page or her Sites And Stories Blog before 11:59 PM (Central US time), Wednesday, August 22, 2018. Only one entry per person, please. Three winners will be chosen at random and announced the next day. Good luck! Posted August 20, 2018 on the Sites And Stories blog. 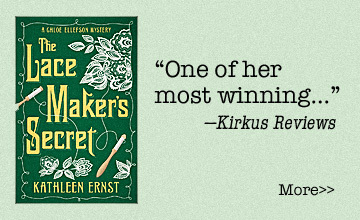 "One of her most winning..."
Kirkus says this about Kathleen's upcoming Chloe mystery, The Lacemaker's Secret. Kathleen leaves today for an undisclosed location to spend a week doing research on her as yet unnamed tenth Chloe Ellefson mystery book, which she is under contract to write for release in fall 2019. (Not to be confused with The Lacemaker's Secret, which is set for release exactly two months from today.) Happy researching Kathleen! It was a hot, muggy, August afternoon, but Chloe readers turned out for a pair of Chloe Ellefson Mining For Justice mystery tours led by staff at the Pendarvis Historic Site in charming Mineral Point, Wisconsin—where the book is set. Kathleen and Mr. Ernst joined the participants for refreshments, a reveal of the fish pond hidden under the floor, a Q&A session, and book signing. Chloe fans are the nicest people! Welcome to the final month of Kathleen's 8 Books in 8 Months Chloe Ellefson Retrospective! The focus is the eighth mystery in the series: Mining For Justice. Look for posts on Kathleen's Sites And Stories blog about interesting aspects discovered when researching the story, and the author's reflections about writing it. Plus a giveaway! According to Amazon, customers who pre-ordered Kathleen's next Chloe Ellefson mystery, The Lacemaker's Secret, also pre-ordered Kingdom of the Blind and Desolation Mountain by New York Times bestselling authors Louise Penny and William Kent Kreuger, respectively. That's some fine company! Thanks to the addition of a second Chloe Ellefson Mining For Justice Tour there are a handful of tickets still available. See the places on site where key scenes take place, and historic artifacts featured in the mystery (including some rarely on display). Kathleen will hold a Q&A and sign books. Tickets are $15 and each tour is limited to just 20 persons. Reserve yours now by calling Pendarvis at (608) 987-2122. A Memory of Muskets - Giveaway Winners! The lucky winners of Kathleen's seventh monthly Chloe Ellefson Mysteries Giveaway are SUSAN NELSON, CARRIE STAMMER and MELISSA WEINSTEIN. Each will receive a free, author signed and personalized, trade paperback of A Memory of Muskets, the seventh book in this award-winning series. Stay tuned for a giveaway of Mining For Justice in August! A Memory of Muskets - Giveaway! This month Kathleen is giving away trade paperback copies of the seventh book in her Chloe Ellefson mystery series: A Memory of Muskets. To enter, leave a comment on the giveaway post on her Facebook Author page or her Sites And Stories Blog before 11:59 PM (Central US time), Thursday, July 26, 2018. Only one entry per person, please. Three winners will be chosen at random and announced the next day. Good luck! Posted July 23, 2018 on the Sites And Stories blog. Chloe Tour at Pendarvis - 2nd Tour Added! Chloe Tour at Pendarvis - Hurry! Posted July 12, 2018 on the Sites And Stories blog. Kathleen just finished her last changes to The Lacemaker's Secret. The newest Chloe Ellefson mystery is now at publisher Midnight Ink Books, which will give the manuscript a final proofreading before sending it to the printer! Set for an early October release, this 408-page book can be pre-ordered now in eBook and trade paperback formats. It's the newest edition of Kathleen's 8 Books in 8 Months Chloe Ellefson Retrospective! This month's focus is the seventh book, A Memory of Muskets. Celebrate the July 4th Holiday with this historical mystery about the American Civil War and the modern reenactors who portray it. Look for posts on the Sites And Stories blog on interesting things discovered researching the story, and Kathleen's retrospective about writing it. Plus a giveaway! Kathleen's next Chloe Ellefson mystery, The Lacemaker's Secret, is set for release this October 8th. And publisher Midnight Ink has signed a contract with Kathleen to write what will become the tenth book in her popular Chloe Ellefson mystery series. This as yet untitled work is scheduled for release in fall 2019. The Death on the Prairie giveaway caused a surge in the number of copies being purchased. As a result it has now been ranked in the Top 1% of all US Print Book Sales—out of over 8 million books tracked—for a running total of two hundred days. Source: NPD BookScan. Death on the Prairie - Giveaway Winners! The lucky winners of Kathleen's sixth monthly Chloe Ellefson Mysteries Giveaway are CAROL SIGLE DOSCHER, MARLENE EZELL, and DEBORAH STANISH. Each will receive a free, author signed and personalized, trade paperback of Death on the Prairie, the sixth book in this award-winning series. Stay tuned for a giveaway of A Memory of Muskets in July! Death on the Prairie - Giveaway! This month Kathleen is giving away trade paperback copies of the sixth book in her Chloe Ellefson mystery series: Death on the Prairie. To enter, leave a comment on the giveaway posts on her Facebook Author page or Sites And Stories Blog before 11:59 PM (Central US time), Wednesday, June 27, 2018. Only one entry per person, please. Three winners will be chosen at random and announced the next day. Good luck! Tradition of Deceit - Giveaway Winners! The lucky winners of Kathleen's fifth monthly Chloe Ellefson Mysteries Giveaway are STEPHANIE GUILE, SHANNON JURKUS, and MICHA RADER. Each will receive a free, author signed and personalized, trade paperback of Tradition of Deceit, the fifth book in this award-winning series. Stay tuned for a giveaway of the sixth book in June! Kathleen's Facebook Author page Likes have just reached this new milestone as a result of this month's Chloe Ellefson mystery giveaway of Tradition of Deceit (see details below). Tradition of Deceit - May Giveaway! This month Kathleen is giving away trade paperback copies of the fifth book in her Chloe Ellefson mystery series: Tradition of Deceit. To enter, leave a comment on the giveaway posts on her Facebook Author page or Sites And Stories Blog before 11:59 PM (Central US time), Thursday, May 24, 2018. Only one entry per person, please. Three winners will be chosen at random and announced this Friday. Good luck! —Robert Olmstead, Judge for the 2017 Edna Ferber Fiction Award, and Winner of the Heartland Prize for Fiction. Posted May 15, 2018 on the Sites And Stories blog. Posted May 8, 2018 on the Sites And Stories blog. Today Kathleen started her annual spring road trip to the Malice Domestic traditional mystery fans conference this coming weekend in Washington, DC. While she's away, Mr. Ernst will be home keeping the office open—under the close supervision of Ms. Sophie the feline muse. Celebrating Libraries Giveaway - Bonus Winner! Having mistakenly named a winner prior to the entry deadline, Kathleen has chosen to name a second winner in her Celebrating Libraries Giveaway! Congratulations to the Stone County Library in Mountain View, AR, which was nominated by Kay Garrett. The library will receive author-signed copies of the first three Chloe Ellefson mystery books: Old World Murder, The Heirloom Murders, and The Light Keeper's Legacy. Posted April 20, 2018 on the Killer Characters blog. The lucky winners of Kathleen's fourth monthly Chloe Ellefson Mysteries Giveaway are GLORIA BROWNING, JULIE CLABOTS, and DONAMAE CLASEN KUTSKA. Each will receive a free, author signed and personalized, trade paperback of Heritage Of Darkness, the fourth book in this award-winning series. Stay tuned for a giveaway of the fifth book in May! Celebrating Libraries Giveaway - Winner! Congratulations to the Pierce County Library in Sumner, WA, which was nominated by Lori Bonkoski. The library will receive three Chloe Ellefson mysteries: Heritage Of Darkness, Tradition Of Deceit, and Death On The Prairie. Posted April 19, 2018 on the Killer Characters blog. This month Kathleen is giving away trade paperback copies of the fourth book in her Chloe Ellefson mystery series: Heritage Of Darkness. To enter, leave a comment on the giveaway posts on her Facebook Author page or Sites And Stories blog before 11:59 PM (Central US time), Thursday, April 19, 2018. Only one entry per person, please. Three winners will be chosen at random and announced this Friday. Good luck! Celebrating Libraries - and a Giveaway! Posted April 17, 2018 on the Killer Characters blog. Posted April 11, 2018 on the Sites And Stories blog. Posted April 4, 2018 on the Sites And Stories blog. Welcome to the fourth month in Kathleen's 8 Books in 8 Months Retrospective, during which the focus will be on Heritage Of Darkness, the fourth book in her Chloe Ellefson historic sites mystery series. In addition to giving away copies of the book, Kathleen will pen a retrospective about the story on her Sites And Stories blog, and Mr. Ernst will also post an article there about things they turned up while researching the book. Stay tuned! What a fun time at the Community Library in Salem, WI yesterday! The kids at the American Girl Fans program in the afternoon were awesome. The evening conversation about the Chloe Ellefson mysteries kept going until the library closed and we had to leave. Thanks to all who came, and to the library for making it all possible! The Light Keeper's Legacy - Giveaway Winners! The lucky winners of Kathleen's third monthly Chloe Ellefson Mysteries Giveaway are CHERIE GRAHAM, KATHY LARABELL, and CAROL MOORE. Each will receive a free, author signed and personalized, trade paperback of The Light Keeper's Legacy, the third book in this award-winning series. Stay tuned for a giveaway of the fourth book in late April! This month Kathleen is giving away trade paperback copies of the third book in her Chloe Ellefson mystery series: The Light Keeper's Legacy. To enter, leave a comment on the giveaway posts on her Facebook Author page or Sites And Stories blog before 11:59 PM (Central US time), Wednesday, March 21, 2018. Only one entry per person, please. Three winners will be chosen at random and announced this Thursday. Good luck! Posted March 17, 2018 on the Killer Characters blog. Kathleen was just named a 2017 All Star Award Winner for email effectiveness by Constant Contact, which provides email marketing services to 5M small businesses and non-profits. This is the sixth consecutive year she has earned this honor. Less than five percent of Constant Contact customers are multi-year All Star Award recipients. Kathleen got to spend some time yesterday afternoon with a wonderful group of girls who attended her American Girl Fans program during the 'dress up and bring your dolls' tea party held by the wonderful folks at the Johnson Public Library in Darlington, WI. Thanks to all who attended, including those at her Chloe Ellefson Mysteries program that evening! Posted March 13, 2018 on the Sites And Stories blog. Posted March 6, 2018 on the Sites And Stories blog. Welcome to the third month in Kathleen's 8 Books in 8 Months Retrospective, during which the focus will be on The Light Keeper's Legacy, the third book in her Chloe Ellefson historic sites mystery series. In addition to giving away copies of the book, Kathleen will pen a retrospective about the story on her Sites And Stories blog, and Mr. Ernst will also post an article there about things they turned up while researching the book. Stay tuned! The Heirloom Murders - Giveaway Winners! The lucky winners of Kathleen's second monthly Chloe Ellefson Mysteries Giveaway are AGNES FLAMEN, ELAINE KLINGBEIL, and JOHN NONDORF. Each will receive a free, author signed and personalized, trade paperback of The Heirloom Murders, the second book in this award-winning series. Stay tuned for a giveaway of the third book in late March! Kathleen visited the Edgerton Public Library yesterday, where she presented her American Girl Fans and Chloe Ellefson Mysteries programs. Between the adorable little girls excited about reading her AG books, and the adults who are love the Chloe series, Kathleen enjoyed her time in Edgerton. This month Kathleen is giving away trade paperback copies of the second book in her Chloe Ellefson mystery series: The Heirloom Murders. To enter, leave a comment on the giveaway posts on her Facebook Author page or Sites And Stories blog before 11:59 PM (Central US time), Wednesday, February 28, 2018. Only one entry per person, please. Three winners will be chosen at random and announced this Thursday. Good luck! See Kathleen's half-page 4-color ad for her 8th Chloe Ellefson mystery, Mining For Justice, which can be found on page 13 of the newly released 153rd issue of Mystery Scene Magazine -- "the oldest, largest, and most authoritative guide to the crime fiction genre." The patrons, Friends, and staff of the Muskego Public Library gave Kathleen a wonderful welcome yesterday. The kids and parents at her American Girl Fans program were delightfully attentive and asked great questions. As did the adults at her Chloe Ellefson Mysteries program. Thank you all! It was a cold Wisconsin evening, but Kathleen and Mr. Ernst received a warm welcome from the crowd that assembled yesterday for her Chloe Ellefson Mysteries program at the wonderful new public library in Muscoda. In addition to local patrons, readers came from Avoca, Boscobel, Gays Mills, and Richland Center. It was a joy to meet them all. Kathleen has created a Discussion Guide for her 8th Chloe Ellefson mystery. You can download a free PDF copy from her Mining For Justice page or by clicking HERE. Now that Kathleen has sent the manuscript of The Lace Maker's Secret to her publisher—and publicly revealed details about the story (see the news item below)—she has departed for a week-long writing retreat at Write On, Door County. Kathleen intends to use the time to begin planning how she will research and write the tenth Chloe Ellefson mystery! This April 4-6 Kathleen will be a presenter at Write On, Door County’s Writing on the Door: Children’s Literature Conference weekend. In preparation for that event Write On’s Maggie Peterman interviewed Kathleen about her childhood experiences, the writers who influenced her, and more. Read their conversation by clicking HERE. Welcome to the second month in Kathleen's 8 Books in 8 Months Retrospective! The spotlight now pivots to the second book in the award-winning Chloe Ellefson mystery series: The Heirloom Murders. Stay tuned for Kathleen's blog post reflecting back seven years about the early days of Chloe and Roelke's relationship, and Mr. Ernst's post about the research that went into the story. Plus copies of the book will be given giveaway! Old World Murder - Giveaway Winners! The lucky winners of Kathleen's first monthly Chloe Ellefson Mysteries Giveaway are SHARON BUTERA, SANDRA REDFORD GRISWOLD, and MARYJEAN SAMER. Each will receive a free, author signed and personalized, trade paperback of Old World Murder, the first book in this award-winning series. Stay tuned for a giveaway of the second book in late February! For each of the next 8 months Kathleen is giving away trade paperback copies of her 8 Chloe Ellefson mysteries, starting now with the first book in the series: Old World Murder. To enter this month’s giveaway, just leave a comment on the giveaway posts on her Facebook Author page or Sites And Stories blog before 11:59 PM (Central US time), Wednesday, January 31, 2018. Only one entry per person, please. Three winners will be chosen at random and announced this Thursday. Good luck everybody! Kathleen sends a big thanks to all who came to the L.D. Fargo Public Library in Lake Mills WI last week for her Chloe Ellefson and Pioneer Foodways programs. And thanks for the delightful potluck between the programs. It was a warm welcome on a chilly night! The 8th Chloe Ellefson mystery, Mining For Justice, is now available in a large print hardcover library binding. Order it now from Amazon, Barnes & Noble or your favorite independent bookseller (find the nearest "indie" by searching IndieBound). The popular Mystery To Me bookstore in Madison, WI has announced their store's 2017 bestselling mysteries, featuring two of Kathleen's Chloe Ellefson books! Welcome to the first month in Kathleen's 8 Books in 8 Months Retrospective, during which the focus will be on the first book in the Chloe Ellefson mystery series: Old World Murder. Kathleen will reflect back on how Chloe and Roelke have grown as individuals and a couple over the last 8 years, and Mr. Ernst will write about some of the historical facts unearthed when researching the story. And copies of the book will be given away!